A few weeks ago, I had the good fortune to participate in a lovely event for the Berkshire Festival of Women Writers, an evening on motherhood and creativity curated, nurtured, and grown by Suzi Banks Baum of Laundry Line Divine. I wanted to share the piece I read that night–an alternate (and longer!) version of the headnote for butter in The Homemade Pantry. Need a little butter video tutorial? Watch me churn that cream over here. Halfway through kindergarten, my daughter Sadie came home in a noticeable funk. She was on the cusp of her sixth birthday, and it was clear that something was very wrong. Although she is usually the type of kid to share her emotions immediately, this time it took some prodding. It turned out that on that day, two boys at school had cornered her on the playground, and they had told her she was fat. Oh, beware of a mother who is protecting her daughter’s body image. That is a force to be reckoned with, I’ll tell you. After all my careful work with these girls, blocking their ears from offhand comments from my friends about their own bodies, countering the steady stream of weight-obsessed media, and even putting a lid on my own residual insecurities, those boys had made my work null. I was angry with them, but even more, I raged at their mothers. After all, where would a five-year-old boy learn that a belly should be concave, and that all women should be skinny? In the weeks that followed, the issue continued to grow. Every day, Sadie would exclaim how fat her belly was, and she began to assert that this dinner and that snack would make her fat. Her little sister joined in, pointing to her belly with theatrical disdain. I was heartbroken, and at a total loss as to what to do. I hail from a family of small Jewish women with large breasts, skinny legs, and very round bellies. My Grandmother tortured herself at Weight Watchers for the final years of her life, just trying to shrink the portly tummy that made her feel so undesirable. She passed her shapely body to my mother who worked tirelessly to defy her genetics, and she, in turn, passed the belly and the breasts to me. I am a carbon copy of the women who have come before me, and, like them, I have not always embraced the curves that come with the family name. But over the last few years, as my babies have become girls, I have lost patience with this obsession with thinness. In short, I am done with it, and in my house, a round belly is a thing of great beauty. In the end, we found a solution, and it was as simple as focusing on the messages that we have stuck with all along. Enjoy your body. Play outside. As long as we stay active and eat good food, our bodies will find the shape that suits them. Eat what tastes good and trust that your tastes will lead you in the right direction. I relaxed again, and when Sadie came home a few months later saying that a friend at school had told her her mom wouldn’t let her eat butter (“a moment on the lips, a lifetime on the hips!”), I took a breath and braced for another round. I am determined to raise girls who are not afraid of butter. With all the challenges that face them, I don’t want them to have to waste their energy on butter angst. Everywhere I turn, there are butter substitutes, diet regimens of dry toast, and errant comments about the caloric dangers of butter. If my girls can continue to taste the treats that make them happy with as much joy as they have now, unmarred by guilt or fear that the bite will ruin their beauty, then I feel I have done something right. And if, somehow IF! I can help them to transfer all the energy they might spend hating their own bodies or feeling guilty about what they had for lunch? Well, with all of that energy, world, watch out. My girls are taking over. Unless you have a dairy cow in your backyard (oh, if only! ), making butter at home is not especially cost effective. Butter is one of those products which miraculously costs less than the raw materials used to produce it, and so for cooking and baking, I continue to buy nicely wrapped pounds of butter made elsewhere. However, butter is still one of my favorites to make at home for two reasons: taste and magic. 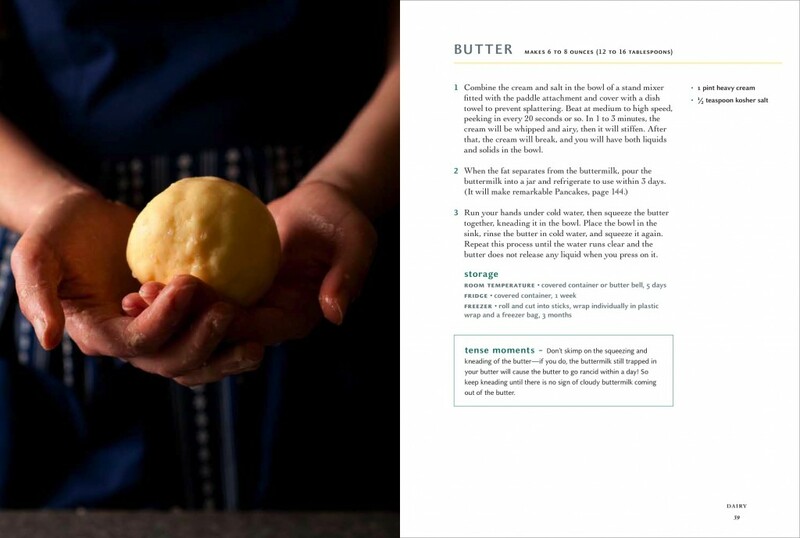 When it comes to taste, butter is one of those foods that we have become accustomed to eating when it is quite old, and the taste of freshly churned butter is nothing like what comes off of a store bought stick. The flavor of the cream comes through in astounding ways; butterfat is the best carrier for flavor, and fresh butter tastes like sun and air and grass. Homemade butter is also particularly conducive to being mixed with herbs for fancy party butters, and I always pepper potluck tables and dinner parties with soft butters flecked with parsley, nasturtium petals, or chopped shallots. As for the magic, you will know just what I mean when you see the butter separate from the buttermilk for the first time. I witness the process regularly, and that moment never ceases to make me gasp. For this reason alone, butter-making is one of my favorite tasks to do with the girls, as they are the best magicians I know. So how do you work this magic in your own kitchen? The process simple, and if you have made whipped cream, you are most of the way there. Many tools will do the job, but my favorite method is to combine a pint of cream with a pinch of salt in the bowl of a stand mixer. Cover with a dishtowel unless you are pleased with splatters on your ceiling, and whip until the butter separates from the milky liquid, about 3 minutes. Pour the liquid into a jar (that’s perfect and pure buttermilk- a wonder in your pancakes), and wash the butter under cold water, pressing it with your hands or a wooden spoon until it no longer releases liquid. That’s it. Spread it on thick, eat with joy in your heart, and share with the one you love most. And yes, as promised, I have one more advance copy of the The Homemade Pantry to give away. All you need to do is leave a comment on this post before Monday at 11:59 pm. Today’s conversation is one that is close to my heart (and my belly), and I would love to hear your thoughts! What food makes you happy? How does food (eating, cooking, feeding people, or all of the above) bring joy into your life? Love this post! What a challenge, raising two girls. I can’t help but think everything you’re doing and their connection with their food will surely help in the long run, even if they have a couple rough patches in middle or high school (those might be unavoidable, but probably able to be lessened) Good job, mama! As a man who had sole custody of a daughter from the ages of three to 11, one might think that I’d have something profound to say about this. Sadly, I can’t think of anything specific, except that I tried to make it clear, in my home, that •smart• people were valued the most, no matter what they looked like. My daughter is now 23 and neither a stick-figure nor obsessed with becoming one. And she likes smart people, so I guess that worked. I love reading your stories of food and life, they are so inspiring. I hope that I can do as well with sharing good food and (someday soon) raising children as it seems you do. I love being connected to food, eating and sharing, through the processes and rituals of making food from scratch. I feel more alive when I am part of the process, and involved in the labor. I got my round lower half from my mother’s side, and my round upper half from my father’s side, and none of that matters because there is butter and you are right, the joy of having butter is better than the misery of not having butter. And this reminds me that I have careful work to do with the little boy, who will be in a world of trouble should he ever misstep and make a girl feel badly about herself. Thank you for this. I saw that people have begun to receive your book, so I will stand anxiously beside my mailbox until my copy arrives. Every night I rub my darling’s belly and I tell her how beautiful it is. We talk about eating healthy food all the time. She is fearless in her nakedness and I hope that the outside world takes it’s good old time robbing her of that. Cooking was my first love and becoming a mom changed the relationship – maybe sometimes I fret more but it has never been so relevant. Firstly, you are an absolutely wonderful mother and I have no doubts that your girls will go very far with healthy focused energy. 🙂 Second, more butter please! My father came from a dairy farm family, so milk and butter were always a staple of our family diet, as were the themes of moderation and fresh, natural foods. It is so frustrating when others appear to be undoing the careful parenting you have done with your kids! But you have instilled your values into them their whole lives, and those values will win out in the long run. This post really struck a nerve with me. I have suffered from body image my whole life. I have curves and then some more curves. My body has found it comfort zone and happily stays there regardless of my efforts. This started at age 12 and is still something I struggle with at 50 ! I hate to hear about children thinking about these issues like I did. My mother has always dieted, its what I grew up with which is part of the problem. I love love your attitude and the fact that you will teach your girls to embrace their healthy bodies no matter what! A better question for me might be – what food DOESN’T make me happy? I don’t even know if I could answer that. For me, as much as my love for food is about really really loving the experience of tasting things and the satisfaction that comes from having made those things that then i get to experience tasting – for me food is always also about community and about relationships. At this particular moment, what comes to mind is a time my mom, stepdad, and I sat down to have a springtime dinner together, and I was fed a certain side-dish for the first time. It’s relatively simple, but delicious. It involves roasted asparagus, topped with rounds of seasoned goat cheese and sauteed mushrooms and red peppers. The goat cheese gets melty in just the right way, and the pairing of those flavours is soo perfect. That night, the three of us sat around the table exclaiming “mmm!” “Mmmm!” and “MMMM!” in succession, and then settled on the blanket statement “People who don’t love goat cheese couldn’t possibly love food as much as we do” which was a statement that I’m sure I don’t actually believe is true (also, it sounds terribly self-centred). But in that moment, it seemed so true. All kinds of foods make me happy. I grew up in our kitchen “helping” make cookies, and then actually helping prepare meals for the family. I still miss listening to my mom talk as I slice peppers and carrots. We live far away from each other now, but I’ll always think about my mother every time I’m in the kitchen. The meals may be more elaborate now, but the satisfaction of providing good food for my husband and myself will always be the same. Thank you for sharing your struggles with your daughters and their body image. My body isn’t “perfect” (whatever that is), but I enjoy eating salads just as much as I enjoy eating a cupcake. I”m a happier person now that I’m OK with what I look like, instead of worrying about the size of jeans that I wear. Most of what I eat makes me happy. But I take special pleasure in the recipes that have been handed down from my mother, often from her mother. They’re not revolutionary, and I usually have to tone down the sugar content to my tastes, but they are simple and give me a sense of connection to my family that I find hard to get elsewhere. Last night, I made my grandmother’s hot fudge pudding. Such a delight to bake a cake that comes out with a layer of chocolate pudding underneath! My mother recalls fighting her siblings for that layer of pudding when she was a kid. I ate it alone, straight out of the baking dish and missing my grandmother. I think I’ve made that pudding cake that Jillian talks about. The recipe is in my Betty Crocker cookbook I got for high school graduation, so it’s pretty old; no fear of butter there! Cheese makes me happy. Making real food that tastes like it’s supposed to is what I like to make and I love watching my close friends and family eat it. I have transformed many of my friends opinions of beets because they just never knew what they tasted like. Your story is heart-breaking and your approach is courageous! Your girls must be so much better off for it! Kelly, I completely agree! My biggest joy comes from transforming my husband’s ideas and expectations of what food is “supposed” to taste like, followed by my Mom, Dad, and sister. oh i loved this post – it touched me in different ways. the haunting echos of my own past and the loving lesson you are providing your daughters. did they enjoy their homemade butter? what did they use it on? i love cooking for others because it is a way i can connect to them both w/ physicall and an emotional hearfelt level. Good for you1 I used to sign my emails “Nourishing bellies”. I feel nourishing bellies whether my children, neighbors or the public, is why I have been put on this earth. Real food creates good memorable meals. Feeding your daughters or sons is important It creates rituals, memories of smells and tastes, stories to savor. Nourish our bodies, our children and each other. I had a biologie teacher in 6th grade that really influenced the way I thought about butter. She told us that it was good for us, absolutly essential for our bodies. She scolded the kids that said that they didn’t eat any!!!! Sinec then I ate butter without the slightest complex. I think the fact that it was a teacher, not a parent that told me this really made the difference. An exterior confirmation of a parents eating/ beauty principles can be helpfull. Finding round idoles can also help, for me it was in art. I love the word “callipyge” which means ” has a a beautifull rear end” it reminds me of anciant statues … A time when round women were admired and powerfull! Alana (I already pre-ordered the book, but I’m sure if I won I wouldn’t have any trouble finding someone to give it to! ), this post brought tears to my eyes (and I’m in a public place…) in a way of sadness for all the messages girls and women in our culture get about bodies, and also for how you handled it with your girls. I don’t have kids and that’s one of my biggest fears around having them – I know what I want to impart, but how do I deal with all those other messages swirling around it sort of breaks my heart just thinking about it and makes me want to only raise them if I can live on a farm in the middle of nowhere (it’s own challenged I’m sure!). I especially love sharing sweets (I’m making lemon squares today for a potluck tomorrow), they just feel like edible love to me. Thanks for writing, as always – you inspire me. Funny how these things work out. I was about to email you to check on your family’s “dietary concerns” so that our Passover feast can be fun for all when I came across your posting on body image and butter. Beautiful! There will definitely be fresh butter on our Passover table (yet another reason why that night is different from all others!). Hope to see you soon. I want to beat up those boys. Sorry, I know that is not a very civilized response, but I started at wanting to shoot them and was able to ratchet it back to just beating them up. You are a wise mother and I congratulate you. I have tried and failed at making butter, but will try again soon due to your encouragement. So today one of your lovely girls asked me what kind of things we would be doing in the summer camp I am leading. My favorite moment of every day is after my boys are in bed, when I finish any kitchen cleaning that needs to be done, and then bake and prep for the next day – yeasted waffle batter, bread dough, granola, quick jam, chopped fruit for breakfast, whatever. It is so relaxing, and it is ‘my’ time – there is rhythm to it, and it feels calming but also productive. I love to eat anything homemade – we avoid processed food at home, though we let our kids have birthday cake and things like that at other people’s houses and we try to take the approach that all food is inherently good, as long as it is actually “food” (as per, say, Michael Pollan). Butter qualifies! 🙂 I have two young boys, and your post has me thinking – I try to make sure that they hear us talking about their female cousins, friends, etc in ways that are not body conscious at all. It drives me and my sister-in-law BOTH crazy (we have boys, they have girls) that family members seem hell bent on characterizing the girls as ‘pretty’ and the boys as ‘active’ – it is so outrageous the way people insist on it. No wonder little girls, and grown women for that matter, have trouble separating their self worth from their looks. Anyway, I am trying to mother my guys in a way that teaches them to respect and value all people, for who they are rather than how they look. I appreciate so much your insights into these issues as they pertain to food. My mom was raised in a house of women who were not given a lot of positive to work with as far as self image went. They were led to believe that their worth was found in the eyes of men. I am not sure how she managed it but my mom made a point to make sure that that was not the way of thinking that I would grow up to hold. I don’t ignore the fact that this has been easier for me being petite, and I hope that when that changes I will think as highly of myself no matter what. I do not have daughters and I envision it to be a constant battle with many opponents to keep young women thinking well of their bodies. Society, for whatever reason, seems to take this war very seriously. I would also argue that for those that are so image and food conscious they end up missing out on a lot of life. What is the point of being skinny if you are not actually experiencing life, and how is a weight watchers pre-packaged meal (or something of the same) healthier for you then a mean that you actually prepare yourself at home? Yesterday Ben got his first hair cut in our new country and although he has probably had about 100 hair cuts in his life, this one left him traumatized because he wasn’t sure how kids would react to his new look at his new school, in this new country. He seemed paralyzed be self conciousness despite tons of encouragement, hugs, reassurance, etc.. In the morning he was definitely still thinking about it because he didn’t want to eat and told me his stomach hurt. Then the school bus came, and Ben was nowhere to be found. After waving the bus on I went back inside and found Ben huddled in a corner crying that he didn’t want to go to school ever again with a new hair cut. Ugg…After finally convincing him to ride to school with me we found his teacher and told her about Bens worries. Within about 5 seconds he was off playing on the playground and his teacher looked at me and seeing my frustration she said, “Cea, I know having a sensitive child is hard but this is what will make him the best friend that anyone could ever have, and then best partner for someone, and even a wonderful daddy someday”….I am trying hard to give my son confidence and it isn’t easy and I am in complete fear of what it will be like when my daughter is this age and older. My fingers are crossed that our issues of hair styles and clothing choices don’t turn into larger body image problems down the road! I always come back to the fact that he knows that he is loved and has parents who care about him completely. Every night we sit down to dinner and we talk about our day and sometimes if we remember, we write about what we are thankful for in our gratitude journal that I keep by the table. And every night I whisper “I’ll love you forever, I like you for always, as long as i’m living my baby you’ll be”……oh and we dig butter in our house! Hee hee, eating butter makes me happy. And it makes my 2 1/2 year-old very happy. So, right after I read your post, I pulled out the heavy cream and salt and mixer and my little one and I made (watched as the mixer did the work) butter. Then we tasted it, then we packed it into a ramekin, poured the buttermilk into a glass jar and brought it on our car trip to our friends house. We enjoyed it with our friends the next day on english muffins with fried eggs. Our joy in food comes from baking together. It relaxes me and my daughter and I can do this together. Then, we’ve got something yummy to share with friends and with dad. Sometimes it is just the thing to bring us down after a tough day. As a mother to two lovely girls ages 8 and 10, and an ever appreciative son who is 12 – we have focused on local eating, eating for flavor and what is in season. We have recently started buying flour ground locally as well – what incredible flavor. We have local milk delivered – and we are now going to try to make butter with some local cream! What a treat! And the remaining buttermilk will be wonderful in some pancakes or multigrain waffles! Thanks! The food that makes me most happy is fresh pasta. The options for how to dress it are almost endless, but never fail to make me smile. And my kids will eat it, and that is always a source of joy. I LOVE going to the Dekalb Farmer’s Market in Decatur, GA and just looking at all of the amazing produce available. My eyes are always bigger than my stomach. So, I end making a Hobo, soup as we call it at our house. Basically whatever looked great that we aren’t going to eat before it goes bad goes into the soup. We typically have this every other week. The Hobo soup, fresh baked bread, great butter and a salad is one of my favorite meals. Never the same twice. Thanks for this thoughtful piece of writing. As a not-quite-anymore young woman, these images of body issues and girls starting self-loathing so young ring true– it wasn’t that long ago for me. I chose to stop serious ballet training as a teenager once it was suggested that I lose weight, perhaps by eating only tomatoes and going daily to a sauna wrapped in saran wrap! I didn’t stop because of wisdom beyond my age or a recognition that this was inappropriate to tell a 16-year-old, but simply because I enjoyed food too much, and severely limiting myself seemed preposterous. My parents and family (and most of my friends) treated it as perfectly natural that one would savor and enjoy meals, and not worry much about weight if one was active. It was never explicit, I am grateful to my parents that they instilled that understanding. In my 30s, there is much talk of weight, bellies, and thighs among my dear girlfriends, and I have decided that enough is enough: I don’t encourage or get angry about weight talk: I just change the subject. My women are lovely, and I won’t be party to their concerns about lumpiness or spend time convincing them, ‘no really, you look so thin; you’re not overweight!’– We all just need to stop spending that time and talk worrying about looking like airbrushed models, and enjoy that next glass of wine, find a creative way to get the 3-year-old to try a new veggie, and enjoy the comfort food (and things besides food) can bring us. Good luck with your girls– it seems like you’re all off to a good start! I was raised with a love of food, and it has only grown: I take pleasure in eating almost anything! I love cooking for friends and family I love, but I spent a number of years cooking involved dinners just for me, living alone in a small apartment with a big kitchen. I valued that time of exploration, and the enjoyment of the meals, even by myself. I know many folks who say that it doesn’t seem worth the effort to cook for themselves alone, so they pull a Trader Joe’s dinner from the freezer, but I think (and hope) there was something valuable in the self-care of 2 hours in the kitchen to sit and enjoy at the dining table alone. Makes me happy? Freshly made, with friends, as a picnic, something I’ve grown (which seems even more like magic than baking). Oh I am now going to make butter with my daughter! Wonderful idea. Would love to win the book! GOOD FOR YOU MAMA!!! Love it. Love all of it. I tell my daughter a variation on this when she has made comments asking why certain people are bigger/smaller than others — everyone is wonderful in their own special way and what matters is that we eat healthy food to create strong bodies. We’re gonna make butter this afternoon! What fun! So, in answer to your question, I love making food that seems decadent, but is made with whole foods, good for those I share it with. I loved this post! Thank you so much for sharing your girls’ experiences. Our fat-phobic culture favors laboratory concoctions over real food – and photoshopped girls over real ones – to a sad extreme. I took to heart the remarks from your commenter who had a butter-supportive teacher. Earlier this week my 4th grade daughter was having a class discussion about the healthy food choices the kids had made that day (not sure why this was happening during computer class?!). My daughter volunteered that she had extra protein at breakfast by drizzling her (homemade date and walnut) instant oatmeal with cream. Apparently the teacher was taken aback and snickered, “That doesn’t sound like a very healthy choice!” My sweet girl was embarrassed. Then the 4th graders were shown a video encouraging them to work out as much as possible. Ugh. You can imagine what my current “mommy mission” is! Nevertheless, I feel so proud that my daughter shared this with me, and that this has happened infrequently enough to jolt her. Raising 3 girls with no scales in the house but lots of butter! I refuse to entertain the idea of getting rid of my beloved butter! LOVE this site, so glad DALS directed me to you! I’m always so excited to hear shouts out to butter and food of the like in our weight-obsessed, processed culture. It’s amazing how far we have come from the days of yore where simple pleasures (which were sometimes chores and bores) produced magic like butter! I came here for a reason: first, I LOVE BUTTER! My mother-in-love sent me with a sweet message with your link, saying how glad she is that I’m my daughter’s mother and that she feels like our Willa will be a force to be reckoned with herself in her love of butter and intense nature (she’s only one and a half). Second, I LOVE BUTTER! Our family is constantly on a search for a vessel for homemade butter. Thank you for continuing to whip and beat and shake that cream! And for writing about it and sharing it with your readers. I now want to make my own butter. How cool is that. I think its great that your encouraging your girls to be active, love food, and love themselves for who they are. It is a life long lesson for most of us. I WAS HOPING I COULD MAKE THIS COMMENT IN TIME TO WIN A COPY OF YOUR BOOK, BUT NO MATTER. AS FOR MAKING BUTTER WITH THE CHILDREN: TRY PUTTING THE HEAVY CREAM IN A JAR WITH A TIGHT LID AND THEN LET THE CHILDREN SHAKE THE CREAM UNTIL IT FORMS BUTTER IN THE JAR BEFORE THEIR EYE. THEY WILL LOVE IT. quick question- do you use regular pastuerized whipping cream or raw to make butter? Just wondering. on another note, I was anorexic as a teen, spent time in an inpatient unit and everything, then suffered with depression and mood swings in my 20s on a diet of diet coke and baked lays. Today, I am at my best weight, look and feel great and eat butter, without remorse along with lots and lots of other real whole foods….including red meat too. Hello! Both raw and pasteurized work great- I love to use raw cream when I have access to it, but plain old heavy cream makes fantastic butter. And thanks so much for commenting–so many of us have similar stories in varying degrees, and it’s so good to hear about your recovery (and your love of butter!). I don’t have kids yet, but this is an issue I think about often when I look towards the future. I want to raise children who have an appreciation for real food, and using their bodies actively; I want my children to never think about “forbidden” foods but rather grow up knowing how to trust their own food intuition. I sure don’t know how to make that happen though! No kids, but tons of nieces and nephews, and I’m always thinking about things we could do together. This post took me back to first grade, when my teacher, on one very special day, had us all sit in a big circle and make homemade bread and butter. (For the bread, we took turns adding the ingredients, stirring, etc., and for the butter, we just passed the jar of cream around and shook it.) And then, after it was all done, we feasted on warm homemade bread and butter. How could I have forgotten how wonderful that was? Yes, I think we’ll do that. Me and my thin, chubby, short, and tall nieces will all make and eat butter and homemade bread. Oh, well said. You have summed up just about everything so perfectly in regards to inherited curves (I’ve got those going on too), healthy eating, and healthy self image. These are words to share. Thank you. “i am determined to raise daughters who are not afraid of butter”. this is up there with some of the favorite things i have read recently. the entire paragraph is spot on! as the mom of three (two are girls ages 7 & 3) i have noticed this battle starts earlier and earlier. we eat healthy, organic and nurishing foods… but we also enjoy our baked goods and snacks. i am after a balance so that at some point they don’t overeat on what we say they cannot have. we stay active as a family (biking, walking, playing games). thanks for this post as it makes me think about those conversations that are to come. I hail from a family of women who also have skinny legs, large breasts, and round bellies. I do zumba and yoga and am in good shape, but can’t kick the belly. So I finally decided to go with it- buying clothes that accommodate rather than pinch. I imagine my own two girls will inherit my belly, too, so it’s really good to get your view on how to deal with the “you’re fat” comments. My older daughter is only 9 but has already started thinking about whether or not she’s fat. Our family also enjoys cooking and making many things at home, and I got your new book last week. I just placed an order from our local dairy, and will be trying the car snacks and marscapone soon! Thank you for sharing your ideas and thoughts and recipes! I just found your wonderful book and have been having so much fun with it! Love this post and I’m also raising girls (3) to love their bodies and enjoy good food. We made butter today & it was a huge hit! With friends over tonight, the most repeated phrase was “please pass the butter”! I am now a Mama who makes butter. 🙂 Good stuff! Thanks and keep up the good work!